Captioned Telephone service, currently available in the United States, enables people with hearing loss to see captions of everything their caller says over the phone. In the same way that closed captions help people with hearing loss to enjoy watching TV, captioned telephone service lets individuals with hearing loss see captions of their telephone calls. A captioned telephone looks and acts like any other traditional telephone with one important difference: it shows word-for-word captions of everything the caller says. 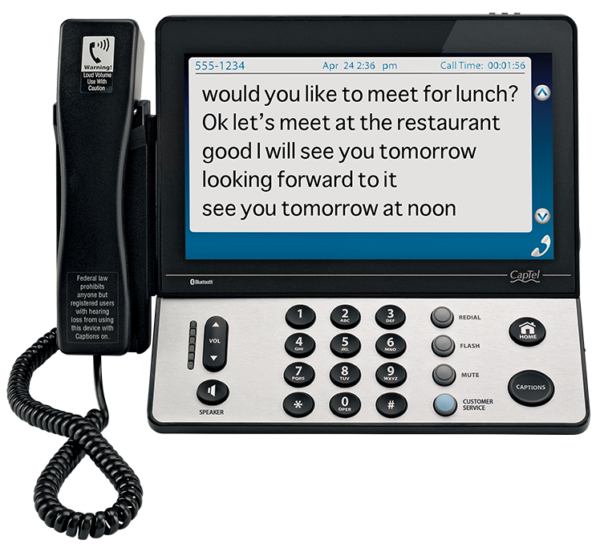 Currently available in the United States and through programs in Australia and New Zealand, captioned telephone service is considered a major development in telecommunications access for people with hearing loss. Since its approval for use in the U.S. in 2003, captioned telephone service has steadily grown to now be the largest relay service offered for people with hearing loss. How Does Captioned Telephone Service Work? Individuals make and answer calls the same way they normally would. Each call is connected through a captioning service, where specially trained operators use speech-recognition technology to transcribe everything the other person says into captions that appear on the captioned telephone display. The user can hear the other person with whatever hearing ability they have, and at the same time they can read the captions to confirm what was said. There are two components to every call – the captioning service which transcribes the caller’s words, and the captioned telephone itself where the captions appear during each call. The process is entirely automatic and transparent to the user. From the user’s perspective, they simply pick up the phone and dial a call like they always would. They can make or receive calls without needing to dial special service number. Then, they are able to read the captions to be certain of what their caller says. Why is Captioned Telephone Service Important? Hearing health professionals note that captioned telephone service works nicely in support of other hearing loss solutions. For example, Cochlear implant recipients report the captions are helpful to re-inforce and confirm they are hearing the spoken words correctly over the phone. Hearing aid wearers note the convenience of reading captions for detailed information, such as receiving driving directions or medical advice, which often can be challenging to understand over the phone. Why is Captioned Telephone Service Not Available Everywhere? In order to offer captioned telephone service on a widespread basis, a funding program must be in place to cover the cost of providing the captioning service. In the U.S., the captioning service is available nationwide as part of the Telecommunications Relay Service (TRS) program, which was established under the Americans with Disabilities Act (ADA) to make telephone services accessible for people with hearing loss. The funding for TRS comes from a federally-regulated fund administered by the Federal Communications Commission (FCC) that collects a small amount from each telephone company’s long-distance revenues to pay for the cost of the service. The net result: individual consumers in the U.S. do not need to pay to use the captioning service. Comparable funding arrangements, administered through each country’s government, are in effect in Australia and New Zealand, enabling captioning service to be provided in these areas. Without a similar funding program in place, captioned telephone service is not possible on a widespread basis. Help bring captioned telephone services to Canada by signing a petition administered by the Canadian Hard of Hearing Association. John Kinstler is the Outreach Marketing Manager and Product Manager for Braille Services for CapTel, Inc. in the United States. With more than 20 years of experience in the telecommunications industry, Mr. Kinstler is on the Board of Directors for Telecommunications for the Deaf and Hard of Hearing (TDI) national consumer advocacy group and has served as president of the Hearing Loss Association of America (HLAA) Madison Chapter. Mr. Kinstler travels throughout the U.S. educating consumers, businesses, and support organizations about telecommunications technology for people with hearing-loss.